This last Friday (03/22/2013), I attended one of the four US-Dakota War Panel Discussions, this one at Sitting Bull College, Fort Yates, Standing Rock Nation, North Dakota. The events are co-sponsored by the North Dakota Humanities Council and the Center for Heritage Renewal. The discussions are a give-and-take, where three Native and non-Native historians and discussants give introductory remarks and impressions of where we are “at” today, 150 years after engagements, battles and massacres — what today we call Total War — started in the Minnesota River Valley in 1862, and concluded albeit temporarily at Killdeer Mountains in 1864. (I say “albeit temporarily” because the Battle of Greasy Grass [aka, Little Big Horn] and Wounded Knee had yet to come). 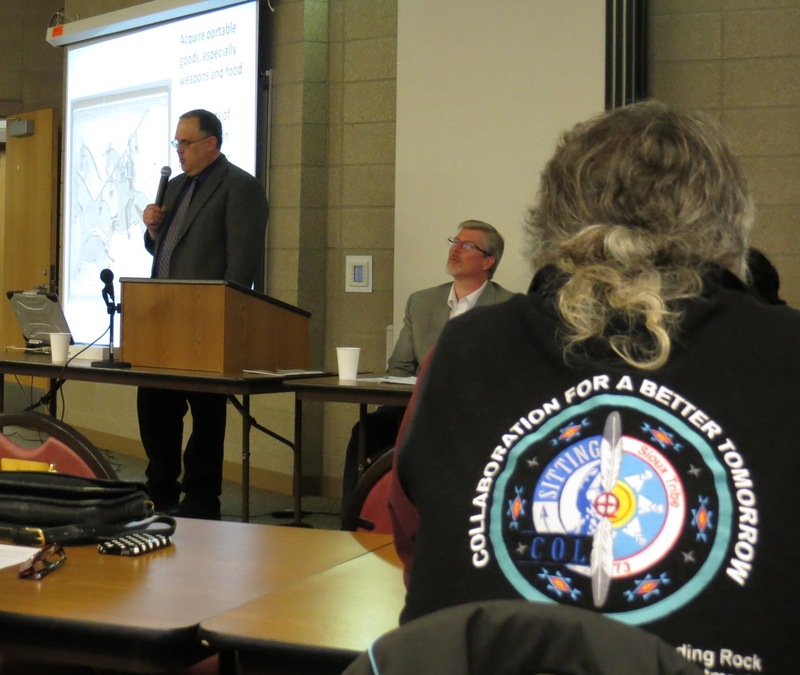 Photo from the US-Dakota Wars panel discussion at Sitting Bull College on March 22, 2013. 1) This public format remains one of the best ways to open a discussion that broadens the exchange not just with the “official” panel discussants, but with the audience members as well. The quasi-lecture and conversational format brings new voices into the fold, and this is important in that it allows researchers an opportunity to hear about historical particulars that simply do not exist in the archives or in “official” histories. 2) In this Sitting Bull College context, one audience participant noted how they, as a Native, felt a bit more comfortable opening up and chatting about the history and memory of the US-Dakota wars: depending on social contexts, individuals may or may not decide to talk about particular points of memory and history. This is an interesting intersection between our Sense of Place and Sense of History: the history we will talk about is largely dependent on where we are and who we are with. This also made me think about how it would be interesting to track how each one of these discussions played out. For example, in chatting with Richard Rothaus after the discussion happened on March 23, 2013 in Watford City, North Dakota, Rothaus noted how the audience contributed a completely different set of voices, and asked a completely different set of questions. This no doubt is due to the different range of cultural back-drops everyone comes from, and also how our vision and memories of the past are shaped by the different cultures we are born in to (for example, the first panel discussion was approximately 240 miles from the second panel discussion, both of which were in North Dakota: the first was at Sitting Bull College, Fort Yates, the second in Watford City, North Dakota). This is the first of 4 discussions, and each discussion is happening (or happened) at a different location. The third discussion will take place on Friday, April 5, 2013, at the Ellendale Opera House in Ellendale, North Dakota, and the fourth discussion will be at the Lake Region Heritage Center in Devils Lake, North Dakota on Saturday, April 6, 2013. More details at the following links here and here. This entry was posted on Sunday, March 24th, 2013 at 11:21 am	and tagged with North Dakota, North Dakota Humanities Council, Public History and posted in Uncategorized. You can follow any responses to this entry through the RSS 2.0 feed.